How often do you face the situation when you and someone else from your family members have an urgent need for a computer at the same time? Do you wish at these moments you could have another home PC? If the ability to have two computers in one is the thing you are dreaming about, IBIK company is here to offer you an advanced sharing a PC software solution that allows you to share one computer at home or office between several users at the same time. Our high-effective sharing a PC software ASTER is an affordable and convenient way to obtain another workplace on the basis of a single computer system. In order to share your computer at home you will need just another mouse, keyboard, monitor and second video card. After you install our sharing home PC application on your computer, both monitors will have independent desktops and both members of your family – equal computer functionality. While ordering ASTER two computers in one application you can choose different options of sharing a home PC that will meet your needs the best way. 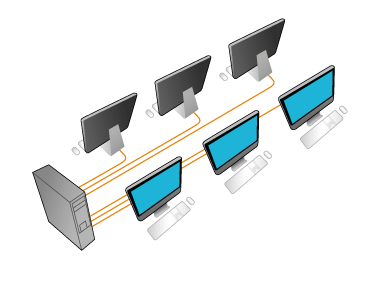 For example, while you share a computer at home you can work simultaneously with two monitors, laptop and TV, monitor and TV or laptop and monitor. Actually, with our sharing a PC software solution ASTER several users will be able to work with the computer independently and simultaneously as if each of them had their own PC. You can be absolutely sure that allowing you to have two computers in one, our sharing PC software won't slow down your system. Besides, as a sharing home PC solution, ASTER makes it possible to save space in your apartments that is very convenient. You can also benefit from a low noise level, reducing electricity bills, lesser dose of harmful radiation, etc. while you share a single computer system at home. ASTER has several version of licenses to be used for different number of additional workplaces. ASTER has been successfully use not only for the computers in computer classes, libraries and accounting (approved for use by 1C) as well as for offices, internet cafes and home use. The program functions very well with office, accounting and traning programs including graphics application and network games. If yoy are not sure if ASTER is right for you, then you can check our solutions examples and read user feedback regarding ASTER. A single computer installed with our program "ASTER" for several workplaces many plus points. Once the computer is on, there is no need for local network. Not only that, ASTER is easy to use and environment friendly. There is long list of plus points for ASTER for multi-user use case scenerio. We guarantee "ASTER" is compatible with Windows XP/7/8/8.1, and Windows 10 and supports many graphics application, office and accounting programs and network games. A computer with multiple monitors is perfect for both small business as well as educational institutions. The program has several versions which are suitable for variety of internet clubs and cafes. Those who are fans of network and online games will highly appreciate and as it allows multiple users to play the same game simulataneously. Among the examples, ASTER is not only being used in hotels, hospitals and shops as well as in organizational exhibitions, seminars and conferences. "ASTER" supports many tupes of video cards and with low price of the program, we hope users will be decisive in acquiring license for multi-user workplaces. Can two people use the same computer at the same time?